Eye is an organ of sight while a camera is equipment that is used to record images. The first and the foremost difference between an eye and a camera is that an eye cannot record an image. The eyes use living cells to detect and interpret the light and convert these into electrical signals that are relayed to the brain and processed into an image. The camera on the other hand uses a diaphragm from where the image is recorded on film or like in modern cameras on tape or digitally. A camera sees in 2 dimensions while the eye sees in 3 dimensions. This means that when we see with our eyes we see height, width and depth. With a camera we only see height and width. There is no way to have the depth in the picture as a photograph is a flat medium. This is mainly achieved by the stereoscopic vision of the eye. A simple demonstration of this can be trying to bring the forefingers of both hands to meet from the sides. This is much simpler to do with both eyes open than with only one eye or almost impossible with a camera. 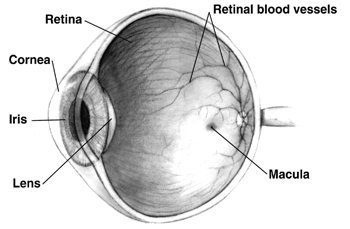 While changing the focus the retina and parts of the pupil adjust the size accordingly. However, in a camera the focus is changed by the movement of the lens. Eye has a blind spot which is also known as scotoma, whereas, the cameras do not have any such limitations. The eye can also adapt itself to the dark and within a few seconds one can get start seeing better in the dark. However, if a camera is not equipped to capture images in the dark it can never get accustomed. The eye is highly sensitive to the dust and foreign particles settling on the outer film. In a camera there is no such problem as any dust can simply be wiped off the lens. 1. Eye is a live organ for sight whereas a camera is an equipment to capture images. 2. Eye uses live cells to detect light while the camera uses a diaphragm to detect light and capture images. 3. Stereoscopic vision of eyes allows 3 dimensional images while camera captures only 2 dimensional images. 4. The pupil adjusts the size while focusing while in a camera lens moves to change focus. 5. Eyes have blind spots while cameras do not. N Amit. "Difference Between Eye And Camera." DifferenceBetween.net. November 15, 2009 < http://www.differencebetween.net/science/difference-between-eye-and-camera/ >. it is vary good diff. You need to learn your English. you helped me complete the whole assignment!!!!! i like it very much……………………. this is damn helpful…thx for ur help..